One of my greatest memories of living in Boston was a party hosted by two friends who?? ?d just learned how to roll their own nigiri sushi and invited seven of us over to try it. They probably had 10 pounds of salmon, tuna, shrimp and crab. There was enough rice to sustain a small Chinese village for a couple of weeks. It was an enormous affair that involved lots of cursing from them and muffled laughter from us. But we witnessed a major triumph when that first roll stayed glued together. It was also a moment of epiphany for me, because that sushi was good. Not just, ?? ?Not bad, I won?? ?t barf, ??? but ?? ?Where can I get more of this???? When I found Husband, he was a sushi virgin and had no interest in changing. I started him out slowly with a Philadelphia roll, filled with cream cheese and a sliver of crab. He did not die or spit. From there, we moved on to a California roll, and then I slowly started introducing him to other maki sushi rolls and nigiri sushi. Suddenly, he was bona fide. He?? ?d eat eel, octopus and things I wouldn?? ?t touch with chopsticks or anything else. Finally, I?? ?d found something he really loved that did not contain barbecue sauce or peanut butter. But you can?? ?t have non-stop sushi dinners on a bait budget. I needed to learn how to make sushi. Making sushi has never been one of my life goals. It?? ?s akin to appreciating master artists, because I am not one, nor do I care to become one. I still remembered watching my friends cuss those sushi rolls. Not something I?? ?d want to repeat in front of the four minors living in our home. So, I started making Slacker Sushi Bowls. All of my favorite sushi ingredients in beautiful bowl form. No special rolling mat required. All you need is brown rice and your favorite maki sushi ingredients. 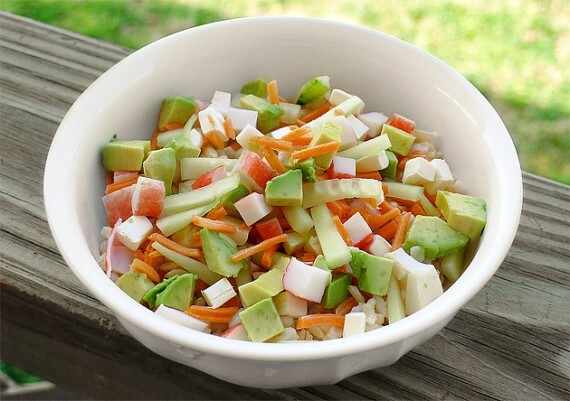 I like to put out small bowls of cut carrots and cucumber, avocado, crab, shrimp, cream cheese, toasted Nori and sesame seeds, and then I hand everyone a bowl with a scoop of brown rice in it and let them go nuts. Each bite is like its own roll, made just for you. No profanity required. For the Rice: Cook rice according to package directions. Let cool to room temperature. In a small bowl, combine the rice vinegar, sugar and salt. Microwave 30-45 seconds. Stir until the sugar dissolves. Pour vinegar solution on rice, and stir to combine. To Assemble the Bowls: Spoon 1/4 cup of rice into each bowl. Top with your choice of carrots, cucumbers, avocado, crab, shrimp, cream cheese, Nori and sesame seeds. (If you?? ?d like, add soy sauce, chili sauce or wasabi, to taste.) Serve immediately. No no no, I?? ?m not eating paleo. Remember, I already tried that and it lasted for like 8 seconds. Meat and me, we?? ?re just not really friends. A… Read More ?? We’ve talked about Tonkotsu Ramen Broth and Marinated Soft Boiled Eggs. Today’s short installment of The Food Lab is all about what is perhaps my favorite part of a bowl of ramen: the tender, salty, sweet, fatty, melt-in-your-mouth slices of braised pork belly known as chashu. It’s a component of a perfect bowl of ramen that’s all-to-often overlooked at restaurants. Dry, stringy, or chalky chashu tends to be the norm, but when a place really nails it, it can elevate a great bowl of ramen to a transcendent one. Transcendent is what we’re after here. Japanese chashu gets its name from the bright red Chinese barbecued pork known as char siu?? ?you know, the stuff you see hanging in windows or stuffed into steamed bao??? ?and it probably came to Japan from China around the same time that ramen itself did. But like ramen, it’s undergone some major alterations over the centuries. Unlike char siu, which is made by painting slices of pork shoulder with a thick, sweet marinade and roasting it, Japanese chashu is a simmered dish made with pork belly. The question: What separates the bad chashu from the good, the good chashu from the great, and how do we recreate the best at home? The first question is how to shape our pork belly before simmering it. Many home recipes for chashu are simplified and just cook the pork belly as a flat slab rather than rolling it. Indeed, many restaurants serve slabs of chashu instead or rolls. If you eat a lot of ramen, you’ve probably also noticed that rolled chashu is usually (but not always) moister and juicier than its more slabby counterpart. This is no coincidence. See, when braising meats, there are a few different elements at play. Time and temperature are the most important, and we’ll get to those in a moment, but surface area-to-volume ratio also plays a role. The more exposed surface a piece of meat has, the faster it cooks, and the more easily it loses moisture. And of course, the more moisture it loses, the dryer it becomes. You might ask, “But doesn’t cooking it in a moist environment keep it, well moist?” In fact, no. The amount of moisture a piece of meat loses is almost entirely depended on the final temperature to which it’s cooked to. With a flat slab of meat, there’s simply more meat getting cooked to a higher temperature than in a rolled piece of meat. With two identical pieces of pork belly, I found that cooking flat vs. rolled led to a good 18% more moisture loss. That’s a significant difference! What about rind on vs. off? It’s up to you, but given enough cooking time, pork rind gets delightfully soft and gelatinous. It’s also worth noting that skin is an insulator?? ?that’s one of its primary biological functions, after all?? ?and it does an equally good job of it on a live pig as it does on a piece or rolled pork belly, making sure that the meat inside receives even, gentle heat. TL/DR: Roll your rind-on pork belly. Secure with string. Good to go. When simmering or braising meats, the goal is for your final product to be both moist and tender. Unfortunately, the cooking processes that lead to these ultimate goals are at odds with each other. See, the moistness of meat is dependent upon the final temperature it is cooked to. The hotter you cook it, the dryer it becomes. Take a look at this chart. Moisture loss in meat is a nearly instantaneous process that’s dependent on how much muscle fibers contract, which in turn is dependent on the temperature they are heated to. Heat a piece of meat up to 205? ?F, and moisture will get squeezed out like a tube of toothpaste. Just like a tube of toothpaste, that moisture is very very difficult to get back in once it’s been squeezed out. At the same time, tenderness is dependent upon cooking time. See, to turn tough cuts like pork belly tender, you have to break down connective tissue?? ?mainly collagen?? ?into softer molecules?? ?mainly gelatin. This takes time. The key is that the time it takes is also dependent upon cooking temperature. So keep your meat at 200? ?F, and it might take only a couple hours to reach tenderness. But of course, it’ll also be hopelessly dry by then. Cook your meat at, say, 155? ?F, and you’ll get extraordinarily moist meat, but it’ll take up to 36 hours to tenderize. If you happen to have a sous-vide water cooker, this is, indeed, the best way to cook pork belly (see my post on Deep-Fried Sous-Vide 36-Hour All-Belly Porchetta for a discussion of the process). 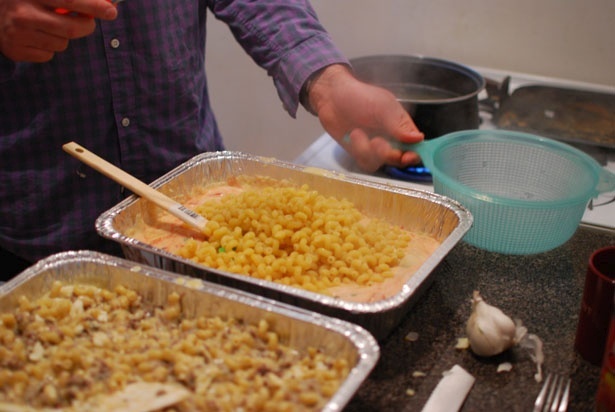 If you don’t have one, you’re best bet is to use heat up your cooking liquid on the stovetop, but do the actual cooking in a low temperature oven, which provides a more even, gentler form of heat. 275? ?F is about the lowest temperature my oven can reliably keep, which translates to an in-the-pot liquid temperature of between 180? ?F and 190? ?F so long as the lid is kept ever-so-slightly ajar (this reduces vapor pressure on the liquid, letting it steam and cool down?? ?liquid will stay about 10? ?F cooler in a cracked pot vs. a tightly lidded one). At this temperature, the pork takes about 3 1/2 hours to get as tender as I like it. Flavorings are pretty straightforward and classic. I use a mixture of soy sauce, mirin, sake, and sugar, with garlic, ginger, scallions, and a shallot or two thrown in. 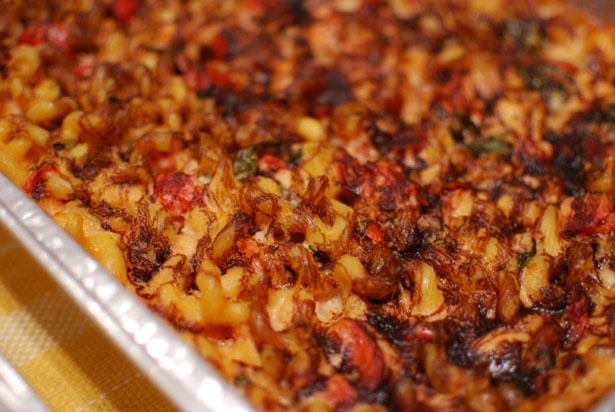 I heat it over the stovetop, add the pork, then finish it all in the oven. Looks ridiculous, right? And it is. But wait! Don’t try to cut into it straight away! Not only will you end up mangling your pork (if you cooked it right, it’ll be soft enough to cut with a spoon and impossible to slice into even pieces), but you’ll be robbing yourself of both moisture and flavor. I know. The temptation to dig in right when it comes out of the oven is overwhelming. But good pork comes to those who wait. Let the pork cool down in its own cooking liquid in the fridge overnight and it’ll not only come out more intensely flavored and moister, but chilled pork is also much easier to slice. See how pretty those look? Only thing left to do is to warm up those slices before serving them in your ramen. There are a few approaches you can take. The lazy man’s method, and a perfectly legitimate one. Just lay the slices in the hot soup just before serving, and in the time it takes to get the bowl from the kitchen to the table, it’ll be hot, soft, and ready to eat. An improved method which will add some great flavor to your slices. You may have noticed that after your pork is cooked, you end up with a ton of tasty liquid. You can, of course, use this liquid to marinate soft boiled eggs. It’s also a tasty way to reheat your pork. Simmering the slices in the liquid for just a few seconds will heat them up and allow the liquid to soak into the inner surfaces, giving them more flavor all around. If you really want to go all-out, after simmering the slices, you can take a blowtorch to them (don’t use those sissy kitchen cr? ?me br??l? ?e torches, go for an actual propane torch from a hardware store) to add charred flavor and crisp, crackly bits. This is the trick you pull out to seal the deal when that really cute Iron Chef-obsessed girl/guy finally agrees to let you cook them dinner. Now would you please excuse me while I go off in the corner to salivate in peace? Arigato. The only question remaining is what to do with leftover chashu, and it’s an easy one to answer: Make pork belly buns. Yep, there’ll be a recipe coming tomorrow! Japanese-style Chashu Pork (Marinated Braised Pork Belly For Ramen)?? “You better not show your face in New York again without making some sort of mac and cheese”. I love a good threat, and just to be safe, I made two. The cool thing was that even though these two pastas had the same base sauce, they tasted vastly different. At the end of the night we voted on which one was better, the mac and cheese that was based on a bacon-blue burger, or the one with tomato basil and balsamic. It was almost a sure thing that all the girls said tomato-basil, and all the guys said bacon-blue. I guess you could also call these “his and hers” mac and cheeses. 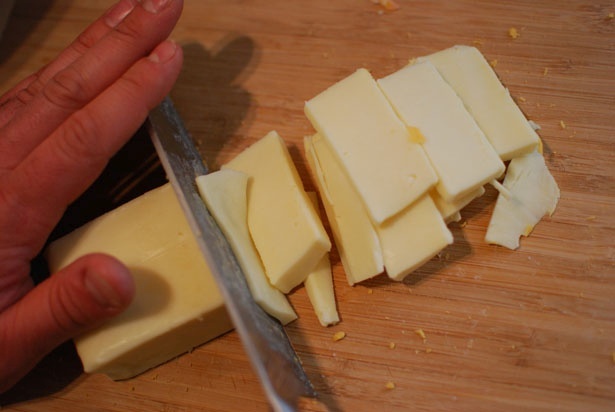 Nick doesn’t have a grater, so I had to just chop all the cheese. 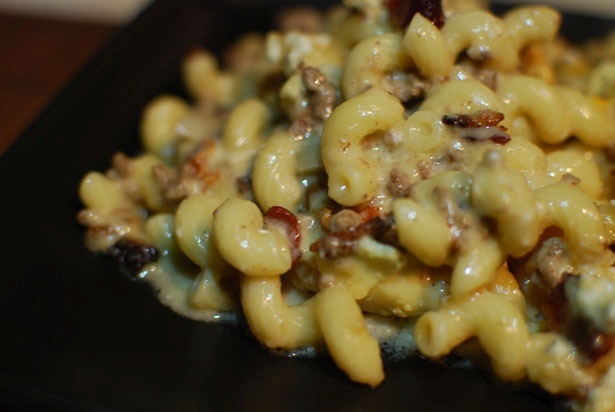 You guys know the mac and cheese deal. 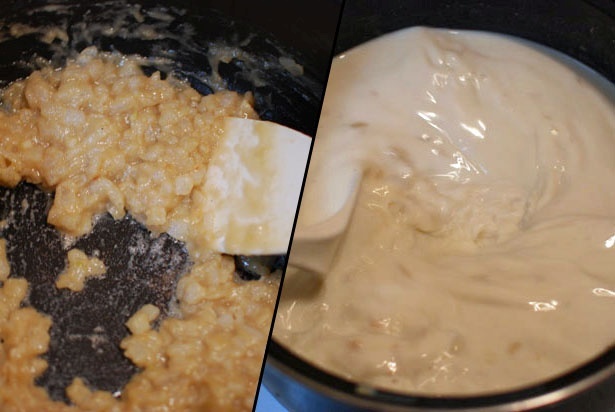 Make a roux, add the milk, let it thicken, add the cheese. There was a lot going on here. 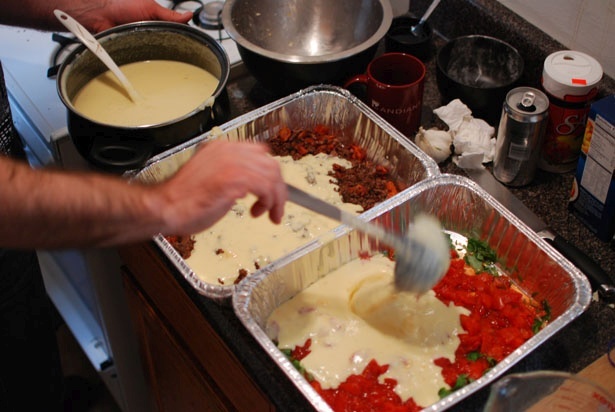 Due to a lack of mixing bowls, pots, baking dishes and other various cooking tools of this nature, the ingredients went into their assigned pans as they were ready. You can see that I have changed into my party shirt. That’s how you know that it’s party time. At this point, it kinda reminded me of hamburger helper. Just a way better version. 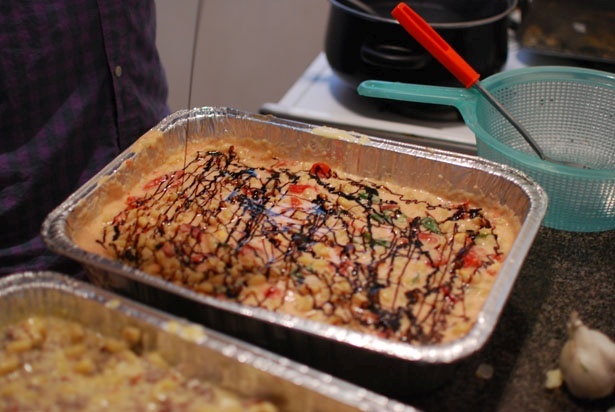 A balsamic syrup drizzle tops the tomato basil mac. It almost forms a crust as it bakes. Very tasty. But for the guys, it was the bacon-blue all the way. ? ?One guy might have eaten a pound of this himself. I wanted to crawl inside and just sort of exist within the mac as it exists within me. Too much? ? ?A new friend brought some candy for dessert and all was right with the world. The base cheese sauce was the same on both these varieties. The recipe here is for one, not both. The ingredients go in in that order. Melt the butter, soften the onion (about 7 minutes), add the garlic followed by the flour 1 minute later. Mix well allowing the roux to cook 4-5 minutes. Whisk in the milk and bring to a simmer stirring often. You will notice the bechamel thicken as it comes to a simmer. 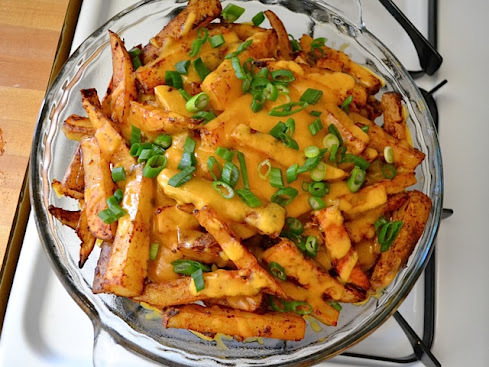 Remove from heat and let cool about 5 minutes, then add the cheese and stir to combine/melt. For the tomato basil one, add 1 28oz can of strained diced tomatoes and a bunch of basil to a baking dish. Mix in the sauce and lastly a pound of pasta. Drizzle with balsamic syrup (balsamic and sugar reduced to a syrup) Bake at 425 for about 45 minutes until bubbly, browned, and delicious. 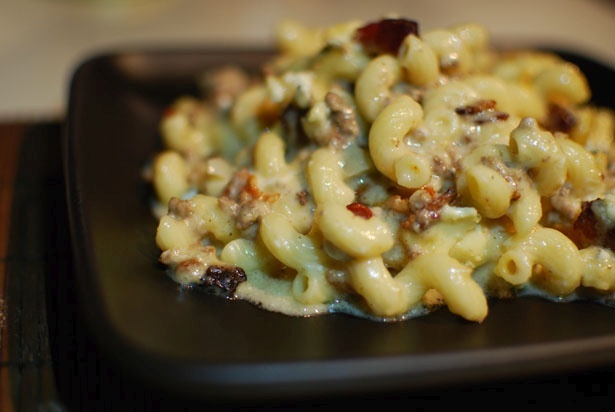 The bacon-blue variety was a pound of cooked ground beef and a pound cooked bacon mixed into the sauce, followed by the pound of pasta. 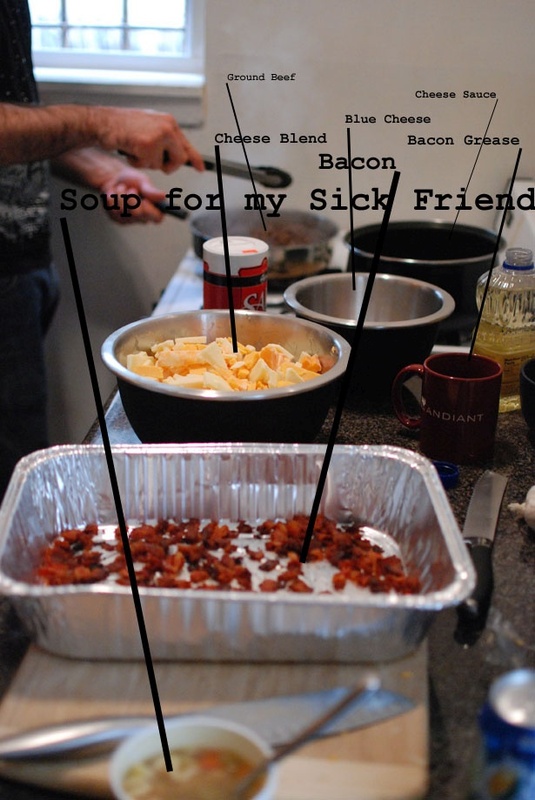 I mixed in about a handful of blue cheese, then added a bunch to the top. 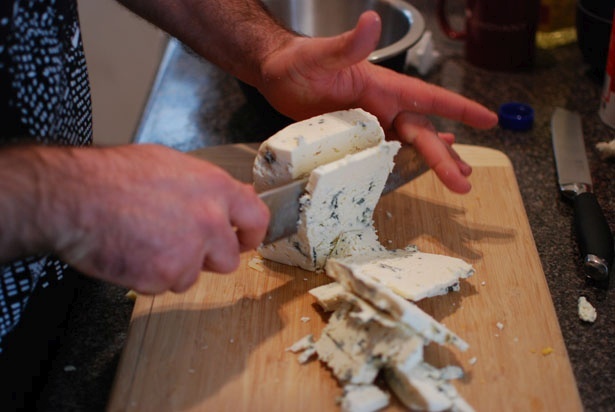 Add more or less based on your blue cheese preference and the strength of the particular one you buy. This one also bakes at 425 for about 45 minutes, until it is browned up on top and bubbling on the sides. 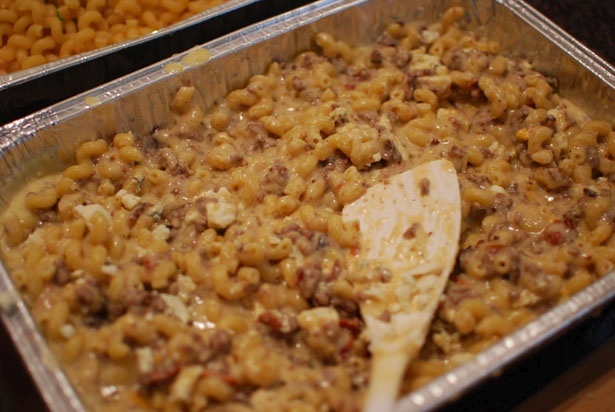 To recap – 1 pound pasta, one pound beef, one pound bacon, 1.5 pounds cheese plus more blue cheese for good measure. And not one of us had a heart attack! If you are looking for me this morning, I’m somewhere jogging and eating lettuce. 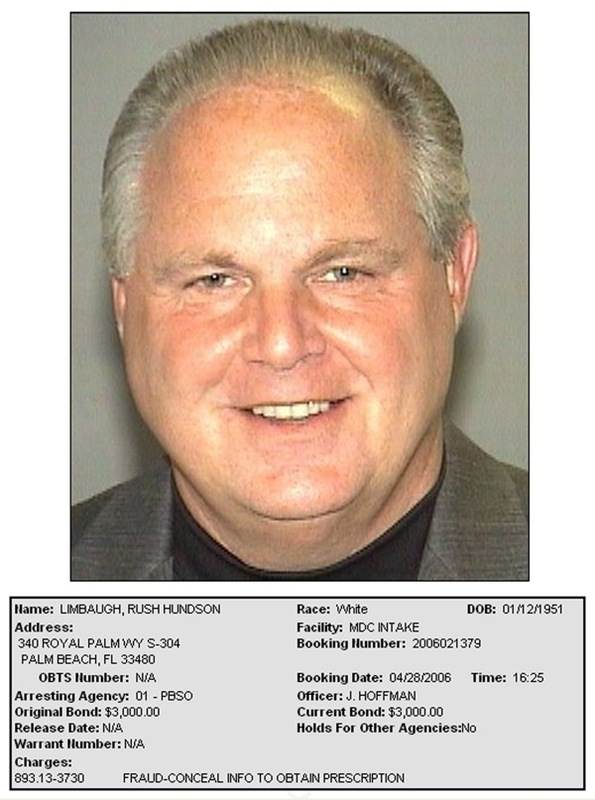 The Atlantic has a list of the 31 advertisers on this morning’s episode of the Rush Limbaugh show. I just put my Netflix account on hold, and will cancel it if they continue to sponsor the program. I’m also going to trade in my John Deere tractor for a Caterpillar.